"Pretty fabulous, actually," added Staff Sgt. Melinda Miller, who's been Gina's handler since May. "She makes me look pretty good." "There is a condition in dogs which is almost precisely the same, if not precisely the same, as PTSD in humans," said Nicholas Dodman, head of the animal behavior program at Tufts University's Cummings School of Veterinary Medicine. 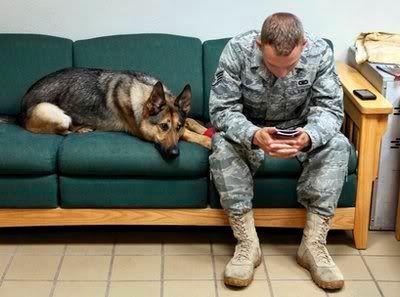 Jack Saul, a psychologist on the faculty at Columbia University's Mailman School of Public Health, said PTSD is a diagnosis developed for humans, not dogs. "That's not to say that animals can't be traumatized. It sounds like this dog was traumatized from the experience of extreme stress and fear," Saul said. "That causes an alteration in the animal's nervous system similar to an alteration of the nervous system in humans." "She'd withdrawn from society as a whole," Haynes said. "She started learning that everyone wasn't trying to get her," Haynes said. "She began acting more social again." "She's such a lovable dog," Miller said, describing how the 61-pound Gina will lie in her lap. "I could literally hold this dog like a baby." But Haynes said they're careful not to let their affection interfere with good training. Treating Gina like a human â€” for example, comforting her when she's frightened â€” can leave her thinking that her handler is pleased when she's afraid. "She's just gorgeous and I love her, but you also have to balance it with â€” you have to do what's right," he said. Gina has resumed some of her duties, searching cars for explosives at Peterson or other nearby military facilities. Eventually, she may be able to return to the kind of hazardous duty she did in Iraq, but that's at least a year away, Haynes said. "We're not planning on doing it anytime in the near future because obviously, we don't want to mess up everything we've already fixed," he said. "It's a fact that fears once learned are never unlearned," Dodman said. "The best thing you can do is apply new learning, which is what (Gina's handlers are) doing," he said. Haynes acknowledged that's a concern, and although he hopes Gina recovers 100 percent he doesn't know if she will. "But, I mean, we don't really have many other options," Haynes said. "You can't really give up on them. They're your partner."